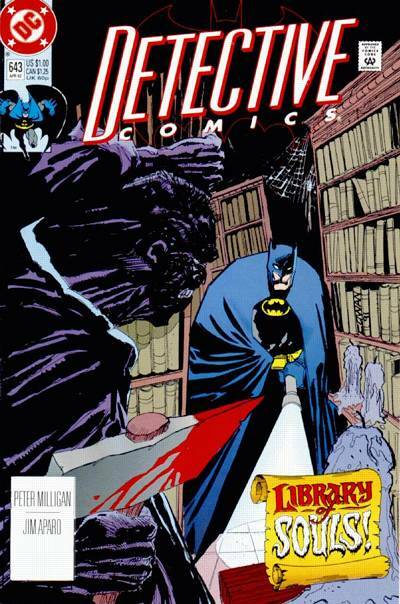 This issue marks the last Peter Milligan script and the last Jim Aparo art on this title. Well, for the time being, anyway. A nice little story that was creepy and interesting, and eschewed the more mystical side of Gotham that Milligan's run has expressed. This is simply a short story of obsession gone awry. And, in a few ways, it's a critique of those who focus their study too much on the minutiae. Not like anyone I know, certainly. I've enjoyed Mr. Milligan's early Batman stuff. It's an interesting read when considering he was writing Shade at the same time - the subject matter of the two runs interweaves without ever actually connecting. But it would be mad to think that Shade and the Idiot never met one another. Or that the madness that overtakes the killer in today's comic couldn't have sprung full-formed from the forehead of the American Scream. Aside from an occasional cameo, Shade steers clear of the DCU proper, so these Batman stories could be seen to fill in the ways in which Shade's adventures across the US affect Gotham City. What was that about paying too much attention to the minutiae?